EOS - European Organisation of the Sawmill Industry | News - From tree to house –Wood Passage installation on tour! From tree to house –Wood Passage installation on tour! The so called "walk-in installation wood passage" makes the transformation from tree to house sensually tangible. As a joint initiative of proHolz Austria, proHolz Bavaria and Lignum Switzerland, it is now touring through the DACH area. 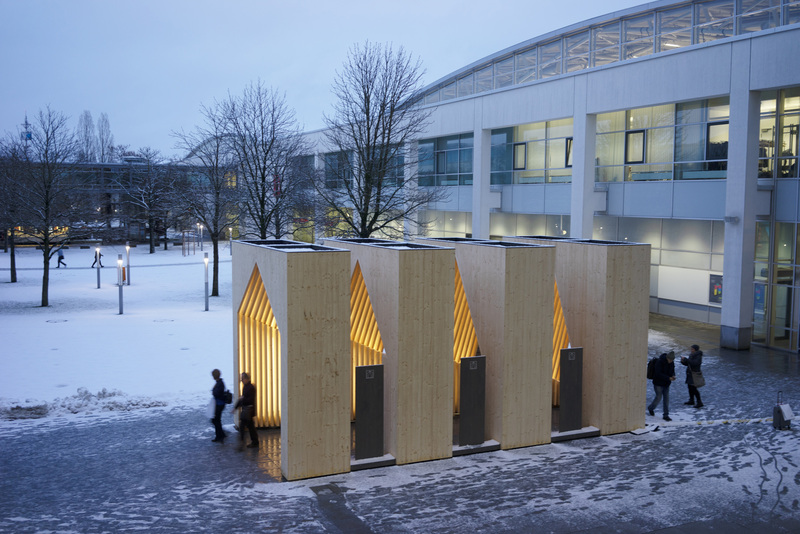 The wood passage was presented to the public for the first time at the BAU trade fair in Munich. Four "gates" made of wood, each about 4 meters wide and 4 meters high, sketch the way from the tree to the house. Building with wood means making houses out of trees and thus making a significant contribution to climate protection and resource conservation. Sustainable forest management and timber construction thus provide answers to key challenges of our time. This was indicated by representatives from Austria, Bavaria and Switzerland at the joint opening. Alexander Gumpp, Chairman of proHolz Bavaria and entrepreneur active in the building with wood sector, moderated the opening. Hubertus Wörner (head of the Bavarian Forestry Administration) from Bavaria, Rudolf Rostenstatter (chairman of the cooperation platform Forst Holz Papier) from Austria and Paul Steffen (deputy director of the Federal Office for the Environment) from Switzerland, as well as the architect of the wood passage, Maren Kohaus of the TU Munich, were also on the stage. Especially in cities, the demand for living space is rapidly increasing and modern timber construction is proving to be key to sustainable development. The completed projects of wood are getting bigger and bigger, for instance housing estates with several hundred apartments and even skyscrapers made of wood. Wood is constantly growing in the forest and is plentiful. Only around two-thirds of the yearly timber growth in Europe is used. If wood is increasingly used in the construction sector, where about 40 percent of all resources are used, it can help save finite resources and is a material which is a model for the future. In addition, every cubic meter of built-up wood locks one ton of CO2 thus supporting the climate. Making these topics visible and comprehensible in cities and urban areas is the aim of the wood passage. The three initiators proHolz Austria, proHolz Bayern and Lignum Schweiz are thus also focusing on more cooperation and shared information on wood in the DACH area because the concerns and messages of the forestry and wood industry are the same in Germany, Austria and Switzerland, as well as the language. For this reason, it is even more important in the future to think and put in practice ways to raise awareness and bolster communication on wood issues across borders. The wood passage is a first tool which implements these ideas and is used by all three wood advertising organizations in various stations in the DACH area. The next time the wood passage will be seen is in mid-May in the context of the presentation of the Holzbaupreis Upper Austria in Linz. In autumn, there will be a showing in Munich. Design, organization and planning of the wood passage are the work of the studio Andrea Gassner (Feldkirch / A) together with Prof. Hermann Kaufmann and Maren Kohaus of the TU Munich / D. Holzbau and Statik lieferte Holzbau Fetz (Egg / A).